An illustration showing the effect that bevel angle and wedge angle have on the shape of a shell (the bevel angle is set equal to the wedge angle). Larger angle wedges produce shells with higher radial growth rate compared to shells made from wedges with a smaller angle. The numbers are the angles. 1. Question: How does the angle of the wedge and bevel angle affect the shape of the shell? Answer: The larger the wedge angle is, the faster the shell will "grow" in the radial direction ( the diameter of the shell ). Same thing with the bevel angle setting on the saw, a larger bevel angle will cause a higher growth rate in the radial and axial direction. The bevel angle setting does not have to be the same as the wedge angle, but it makes the spiral cross section easier to model because the blade will be square to the top surface of the wedge at the midpoint of each cut in the center of the "C" shape. 2. Question: What happens if the thin edges of the wedge are left like a knife edge, wouldn't that fill the central hole through the middle of the shell? Answer: Although it seems like that would help cover the central hole, leaving a sharp or too thin edge causes a lot of problems. The beveled cut through a sharp edge does not cause the outline of the bottom side of the segment to be any larger than the top where there is no thickness. The thin edge is best left at least 1/8" thick in order to have enough axial growth to provide enough wall thickness in this area. Other problems with having a sharp edge include chipping as the blade cuts through the edge, and warping when glue is applied. 3. Question: What is "radial" and "axial" growth? Answer: Radial growth refers to the radius or diameter of a shell increasing as segments are added. Axial growth refers to the width of the shell along the axis of the shell which is along the length of the thin edge of the wedges. 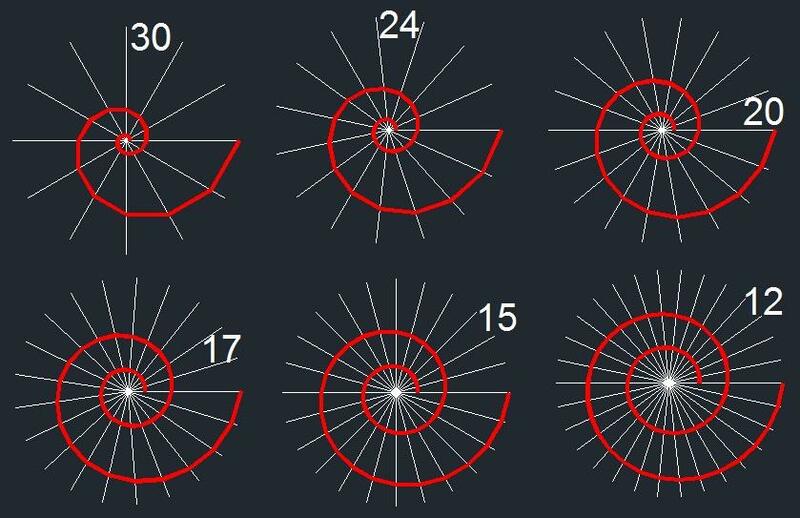 The radial growth rate is not a constant, as the shell becomes larger in diameter each segment will make the diameter larger by an amount more than the previous segment. Axial growth remains constant. 4. Question: Why are multiple wedges needed? Answer: Because if you tried to make a shell with a single wedge you would see that the shape of the outline of the bottom of a segment would not be much bigger than the shape of the top for making the next segment. The wall thickness of the shell would be extremely thin. This is compensated for by using multiple wedges in rotation. More wedges used = thicker walls. And because there is so little growth along the thin edge, this part of each segment will be the thinnest part. Make it easy on yourself and use plenty of wedges in the rotation, and leave the thin edge thick enough to give the segments enough strength. 5. Question: How important is it to surface the joints flat? Answer: VERY! This will make or break your work. The little bit of extra time spent paying attention to this detail will definitely be worthwhile. If the wood has any bow to it and is forced together during gluing, the error in the flatness of the joint is cumulative as the shell becomes larger until it gets to the point where the segments break. If a shell is glued together with a lot of stress on the joints it is very likely to come apart later A piece of heavy 1/4" plate glass a little larger than a sheet of sandpaper is not expensive, and is very flat. Make sure you do not bend the segments while surfacing, use a few dots of hot glue to temporarily attach a wood block to the opposite face to prevent bending if needed. I only do this when the segments get really large and requires more time to surface the entire joint. A common error is to sand more wood off in one place, use even pressure. 6. Question: What happens if the starting shape is something besides a circular arc? Answer: It will not have much effect on the final shape of the shell. If you have ever drawn equally spaced loops around some central outline or text, you might have noticed that it becomes more and more rounded as the loops become larger - the effect is similar when making shells. 7. Question: How do you keep the shell from having bumps and dips in the surface from sanding? Answer: On the exterior of a shell I use a sanding disc in a drill press to knock down the corners formed at each segment joint and do most of the sanding. Always keep the shell in motion while sanding with the drill press. Like many things, it just takes some practice to get good at it. Blow the dust off with compressed air and feel the surface back and forth lightly with your palm and fingers - that will tell you where attention is needed. Interior sanding is optional and adds a lot of time to making a shell. I use two different flex shaft tools for shaping and sanding the interior. A rotary power carver with a structured carbide ball is my choice of tools for making the interior facets rounded. My choice for interior sanding is done with a foam ball sander using a drill press powered flex shaft tool turning at much lower speed (around 1000 rpm) than the power carving tool (over 20,000 rpm). You can do some of the interior sanding to groups of segments before gluing them to the shell, but the joint is still going to need to be sanded afterwards. Interior sanding is the most difficult part of making a shell. 8. Question: Could a shell be multi-colored with contrasting woods, or does it all need to come from the same piece? Answer: Being segmented and made from multiple wedges it would be very easy to use more than one kind of wood to make a shell. Personally, I prefer to use one kind of wood and try to make patterns similar to markings of a nautilus shell by using growth ring patterns. It's just a matter of preference, and there are many, many possibilities for making contrasting color patterns. I would suggest keeping it simple for your first few shells as you learn before trying something more complex.